Today we will take you through our Casio PX-860 review. If this is not your first foray into the world of electric pianos, then odds are you know Casio. They have a reputation for making some of the best options on the market. They are known for making great, responsive keyboards, and high-quality sound engines. Indeed, these attributes may describe their product line at large. However, that isn’t to say that all of their products are perfect. You shouldn’t base your buying decision on Casio’s reputation alone. Instead, inform yourself by studying the ins and outs of this instrument with us. Read on for your Review of the Casio PX-860! Inform your purchase by taking a look at the important features found below. Everyone loves a good furniture quality stand, right? One of the unfortunate consequences of a keyboard is that they don’t usually have much cosmetic appeal. 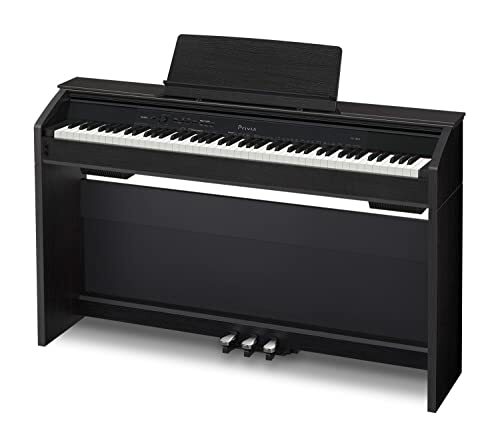 A good acoustic piano is as much a piece of furniture as it is an instrument. 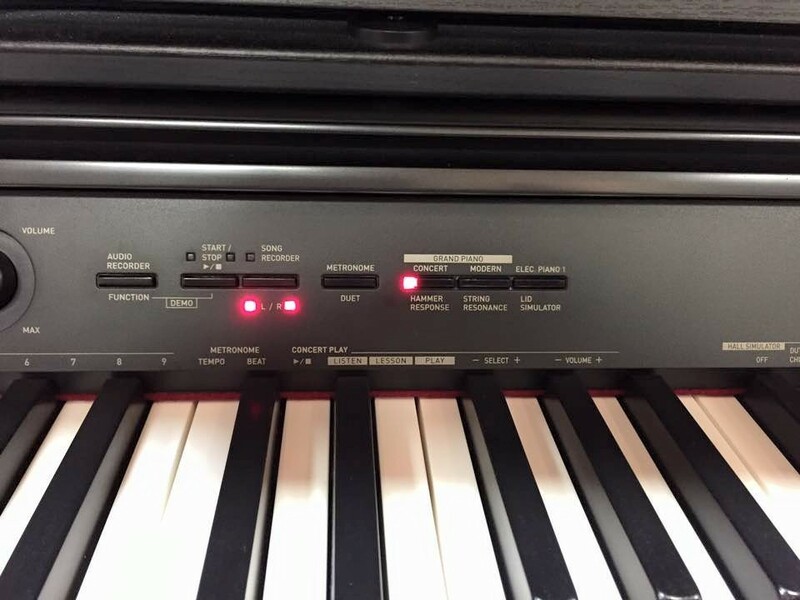 The nice thing about the Casio PX-860 is that it features a design that mimics the look of an acoustic. To the unsuspecting eye, it will be very hard to discern the design from that of an upright. The nice thing about this is that it even features the same pedal set up of an acoustic. Usually, with keyboards, the pedals are plugged into the piano as an accessory. There is nothing wrong with this approach. It certainly gets the job done. However, it also obviously feels and looks much different than what you might be used to. The built-in pedals are a small, but nice touch that many will appreciate. Now, all of this said, the pedal setup is not perfect. In particular, we found that the sustain pedal feels and performs a little bit awkwardly. Simply put, it just doesn’t quite feel like an acoustic. We also found the stand to be a little bit wobbly and fragile. Through normal use, you won’t have any problems. However, under wear and tear, there may be some durability concerns. These things aside, it is an excellent stand! Casio makes really great keys. It’s just a fact of life. One of the issues with buying an electric keyboard is that it often feels quite different than the acoustic alternative. This is not the case here. Casio makes the keys feel more realistic through use of a high-end synthetic ivory. This feature eliminates the complaint you often see that an electric key feels plasticky. They also further improve the setup by fulling weighing and grading their keys. This means that the resistance each key provides will imitate the setup of an acoustic. Higher notes will feel a little bit lighter, while lower notes will feel a little bit heavier. Last but not least, you also get Casio’s tri-sensor technology here. The tri-sensor technology is a great feature that ensures your keystrokes resonate the way that they would on an acoustic. When you play softly, the piano produces a soft tone. When you play loudly, it produces a loud tone. 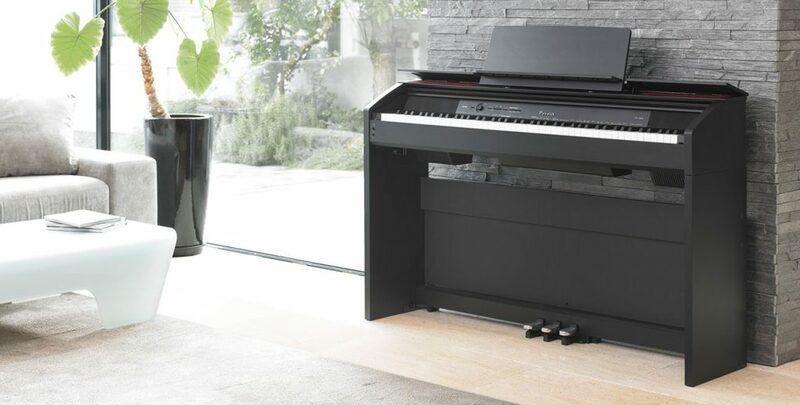 The high-end sensors simply ensure that the piano is as responsive as possible. You also get a good sound engine here. Casio actually advertises that the AiR sound engine at work in this piano generates a sound that is comparable to a nine-foot concert grand piano. Don’t expect this keyboard to sound like a nine-foot concert grand piano. They may have modeled the sound engine after just such an instrument but the sound just isn’t’ the same. Still, that isn’t to say that it isn’t very good. It is. 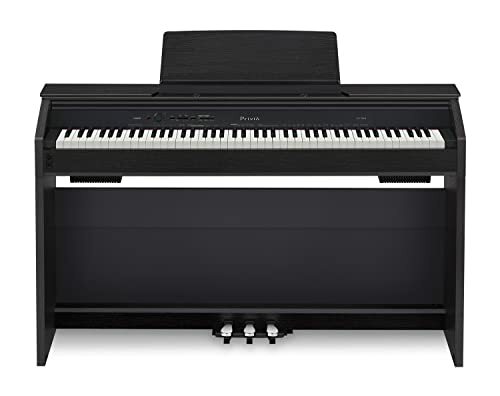 For an electric keyboard of this price range, the sound quality is quite high. It does still have that hollow, keyboard quality to it, but then that is the case with most options out there. If you want to truly free yourself from that issue, you should either consider going acoustic, or plan on spending a lot more money. Otherwise, if you want a nuanced sound that leaves little to complain about, you get it here. The issues that we bumped into were not extremely serious. Really, pretty much all of the problems that we found are attributable to the price. The first thing issue that most owners would encounter pertains to the base. While the furniture quality stand looks great, it isn’t quite as sturdy as some of the other options. When you play with vigor, you are probably going to notice that it wobbles a little bit. This may be a little bit irritating over time. More importantly, it also poses the question of long-term durability. The stand does seem to have a somewhat fragile quality to it. Never great to see, but then pianos also don’t go through too much wear and tear. We also found that the sound has a somewhat hallow quality to it. The truth is that unless you are willing to pay a few thousand dollars, you are always going to bump into that issue. Electric keyboards are great for a thousand different reasons (and that probably isn’t even hyperbolic). However, the simple fact of the matter is that they usually don’t sound exactly like an acoustic. The sound engine is really good. It just may sound a little off to ears that are used to the world of acoustic piano. These things aside this is a great option at a very fair price. By now you have learned quite a bit. In fact, perhaps you have heard more information than you can be expected to keep track of. If so it’s understandable. We’ve gone over plenty of information about what this product does well, and what it struggles with. To help you digest it all, we have boiled the list down to these pros and cons. Final thoughts? Like any product, the Casio PX-860 has pros and cons. However, you probably realized that we feel it has more positives than negatives. There is no pretending that this isn’t a good product. It features a great, responsive keyboard, and a sound engine that would be hard to beat for the price. And of course, it also looks really great. It is a little on the pricey side for some budgets, and the stand is a little fragile. Still, for what your money buys you here, we think it’s a deal with lots of value. Now its just time for you to decide if this is the instrument for your home.